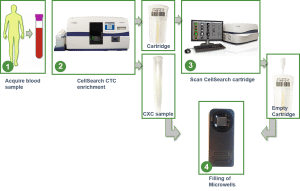 The CellSearch system is the only clinically validated, FDA-cleared blood test for enumerating circulating tumor cells (CTCs). The system concentrates CTC from whole blood transfers the concentrated CTCs to a CellSearch cartridge. 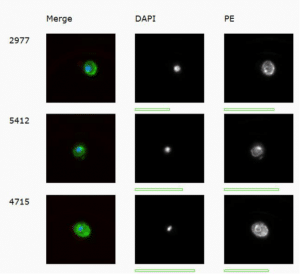 Next immunofluorescence images are acquired and a CTC is identified on the presence on DNA, Cytokeratin and negative for the leukocyte marker CD45 (http://www.siliconbiosystems.com). VyCAP’s Puncher system for isolation of single cells is fully compatible with the CellSearch system to isolate single CTC that have enriched and enumerated by the CellSearch system. VyCAP has developed a protocol to isolate CTC from the CellSearch cartridge. 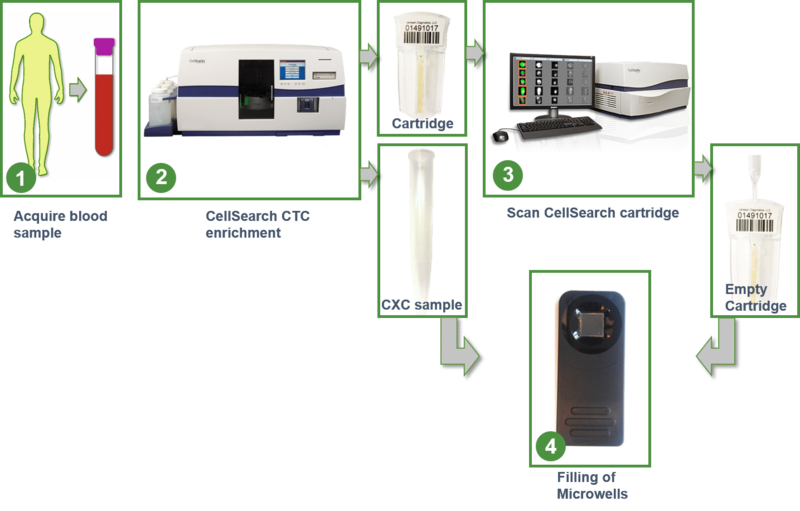 CTC enriched samples can be transferred to VyCAP microwell chip from the CellSearch tube (CellSearch CXC protocol) or from the CellSearch cartridge after scanning and enumeration of the CTC in the cartrdige. Using VyCAP’s protocol for transferring CTC from the cartridge, the total isolation efficiency for single CTC that are present in the CellSearch cartridges, ranges from 70 to 100%. This includes the transfer of the CTC from the cartridge to the microwells chip, imaging and identification of the CTC in microwell chip on the Puncher system, and isolation of the found CTC towards an Eppendorf tube. Next the microwell chip is scanned on VyCAP’s Puncher system and CTC are isolated for DNA analysis. Image below presents fluorescence images of CTC in VyCAP’s microwells that have been transferred from a CellSearch cartridge into the microwell chip.